Use of our squash courts is included in your membership at Bloomsbury. We offer something for all abilities whether you're looking to try a new sport or are interested in joining one of our social leagues. 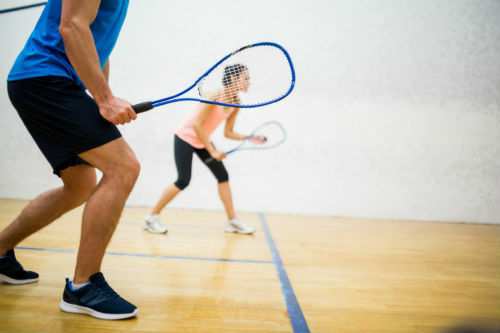 Squash is an excellent way to get an effective cardiovascular workout, regardless of your ability, gender, age or fitness. An indoor sport, you can play year-round without worrying about the British weather! It’s easy to meet new squash players at our club. You can join one of our popular social leagues or simply buddy up with another player. Just register your interest at reception stating your level of experience; beginner, intermediate or advanced. Our squash coach will then contact you to help you get started. Our resident squash coach, Hishi Kahn, is available for adult private and group lessons every Monday and Wednesday from 12:00 - 18:00. Hishi is Level 3 ESRA-qualified and has vast experience coaching players of all abilities. £35 per 45-minute session for members. £50 per 45-minute session for non-members. This includes a £15 day pass required to access the club. From time to time we run seasonal offers and discounted packages, so please contact us at reception for further details. We have 2 courts available to hire. Squash courts are free to hire for members and can be booked Monday-Friday: 07:15 - 20:45 and Saturday-Sunday: 09:30 - 17:45. Non-members will need to buy a day pass for £15. This gives you access to all facilities at the club, not just the squash courts. You can hire a racket for £2.50 per visit. We sell squash balls for £3 each.